While DotComGuy is "always online" to be viewed, he is not always online to chat with. The stats from this page are indeed the results of being "always online" in the original DotComGuy chatroom on dalnet. To get into this chatroom you need to download mIRC and join #DotComGuy on irc.dal.net. For help connecting to irc go here. DotComGuy's year is over, but that does NOT mean chat is over! IRC Chat (irc.dal.net #DotComGuy) will be still be going for a LONG time. Also, the java chat room is still up. You can get to it by going to DotComGuy's New Web Site and clicking on Chat. 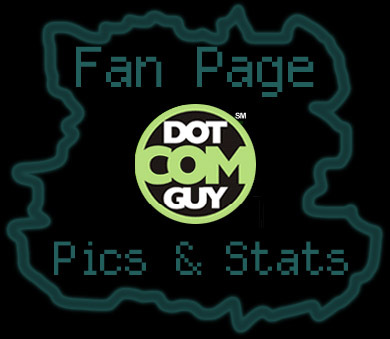 To see the latest info on DotComGuy also check out his new web page. This web page will still continue to be u pdated with stats of the year 2001, and I am still taking additions to the fan section. =] If you were hiding all year, but still were a fan of the project or the guy, get yourself added. Also check out the DotComGuy CD where you can purchase yourself a copy of the entire year's worth of chat logs. If your pic is not on this page and you would like it to be email [email protected] with your pic and some info about you. Make sure in this email you include your irc nickname. If you are on this page and you have a mistake in your listing or want more added to it (either text or pics) email me as well, but put UPDATE in the subject of your message. Note: To the one fan whose email message I accadently deleted: (In April/May '00) I'm sorry. Please resend your email and I'll get you up ASAP..